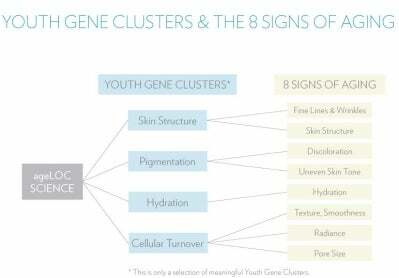 Clinical study results, genomic analyses, and substantiated research from ageLOC® science has led Nu Skin scientists to identify specific functional Youth Gene Clusters that are responsible for youthful skin attributes. The expression of skin-related Youth Gene Clusters is responsible for the signs of aging on our skin. Through ageLOC® science, Nu Skin has the ability to PROMOTE THESE GENES to behave more youthfully, helping to restore a more youthful balance in the skin for a younger looking appearance. "In order to retain a youthful appearance, genes must regain their youthful activity patterns. By analyzing human tissue at the genetic level, we've learned the crucial role of gene expression in retaining one's youth."